CONCORD, OH - You can't help but feel that all's right with the world when you walk into the clubhouse of Little Mountain Country Club. There's rock 'n' roll music streaming through hidden speakers, and all three pro shop/lounge attendants are a) female and b) hot. Leather couches surround a TV the size of Texas, and a sizeable outdoor patio begs for someone to use it for a kegger. It's almost a shame you have to leave the rustic, airy lodge to go play the course. Not really. The course, designed by the famous Hurdzan & Fry team, is just as delightful a spot to hang out. Unfortunately, you might be hanging out in bunkers most of the round as there are 80, some so deep you'll need a grappling hook to haul yourself out of 'em. On the flip side, there are hardly any water hazards. Ellison Creek, visible about eighty feet below the back nine, and Lake Erie pose no threat whatsoever but merely provide great scenery. 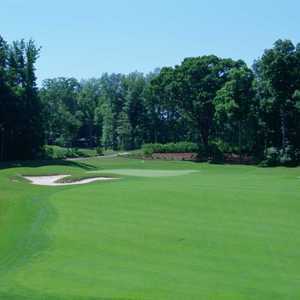 "This course will remind you of being in the Carolinas," says Director of Golf Jimmy Hanlin. 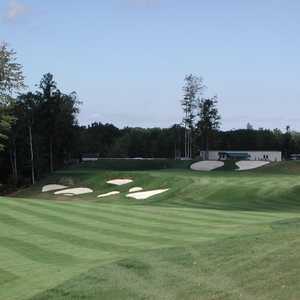 "There are mature trees, 150 feet of elevation changes, huge fairways and huge greens." The Carolinas might be a stretch, but who cares? Bluegrass left to grow wild in spots invokes somewhat of a coastal feel, but the artistry of the course in general won't make any golfer care if they're in Tuscaloosa or Timbuktu. Jagged pieces of rock line part of the eight miles of uninterrupted concrete cart paths, mostly to keep carts on the paths where necessary. Several holes feature elaborate stonework, either lining a pond or tiny stream. 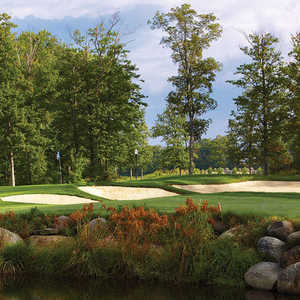 You don't have to be a tree hugger to appreciate some of the most breathtaking views offered by a golf course in Ohio. "This is definitely one of the best courses I've ever played," said Bob Karshner, a boilermaker and 5-handicapper who claims to play 200 rounds a year. "The conditions are very good, and the scenery is excellent." Karshner isn't a member of this semi-private club, but, as a resident of nearby Painesville, wanted to see what all the hype was about. Only four years old, the club is still benefitting from being "new" and located in a city that Hanlin claims ranks second in growth next to Medina. "People are still coming out to play here to see what we're all about," Hanlin says. "Right now, we're happy with the rounds we have and would be happy to keep it where it's at." Even though the club has around 160 members, there's still plenty of space for public golfers, although Hanlin advises reserving tee times up to two weeks in advance. The two nines are a study in opposites. The front, at 2,905 yards from the middle tees, is significantly shorter than the back and features two easy par 4s (327 and 302 yards) and a par 5 of 482 yards that the average joe could consider going for in two and trick himself into believing he's John Daly. The back nine, at 3,214 yards, borders on ridiculous with three par 4s over 450 yards, the longest being 474 yards. What, are they hosting a major sometime soon? Not. A couple of powderpuff par 3s reachable with wedges balance out the killer par 4s. "The front nine is the placement nine," says Hanlin. "You don't have to hit your driver all that much." True. And some of the holes seem narrower than he describes them because of trees lining them all the way down. It seems space was an issue when the course was built, whatwith its short length (by today's standards anyway) of 6,628 yards from the tips and tight layout. Many of the fairways are adjacent to each other on this 130-acre spread. But the good thing is that the homes on 80 one-acre wooded lots bordering the course are set back far enough that a ball would have to defy physics to land in the yard. Based on the service alone, it would be hard not to have a great time at Little Mountain Country Club. All the staffers are friendly and take care of you well whether you're a member or not. And Director of Golf Jimmy Hanlin plays the consummate host. The course is creative, challenging and well-maintained. The lounge offers only pub grub, but a nice touch is a selection of wines on a rack behind the counter. An ample lockerroom with showers and toiletries is a great convenience. A bummer is that there is currently no driving range, but it's under construction. This is not a monster-long course, but there are too many Tiger-proof courses these days. The traps will offer mortals more than enough bang for their buck.